Winnie & Walter’s Rerun Feature and a Challenge! Edited: I am late in posting my post for Winnie & Walter’s rerun feature. I scheduled it and for some reason I did not see the post live when I woke up this morning. So here I am editing the post again and adding my apologies for not posting on time. Rerun is a feature at Winnie & Walter’s blog which runs first of every month where one product is featured and that product is on sale for the entire month. There are plenty of inspiration using that product on W&W Blog for you by the designers. 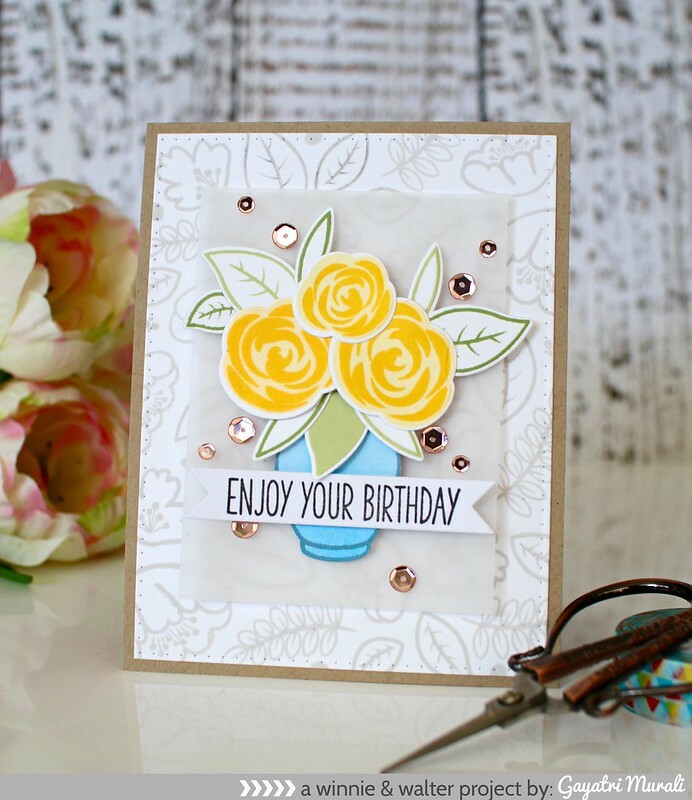 This month the featured product is In Bloom: Lola’s Bouquet. I love this stamp set and have used this set so much that some of the stamp are very stained. You know what I mean! I am so glad that there are coordinating dies for this set now. Here is my card using this stamp set. I have stamped the outline flowers and leaves images from the stamp set using light grey ink on a white card panel. Die cut the panel using the largest rectangle die from Essentials: Katharine Cutaway and adhered on a kraft card base. 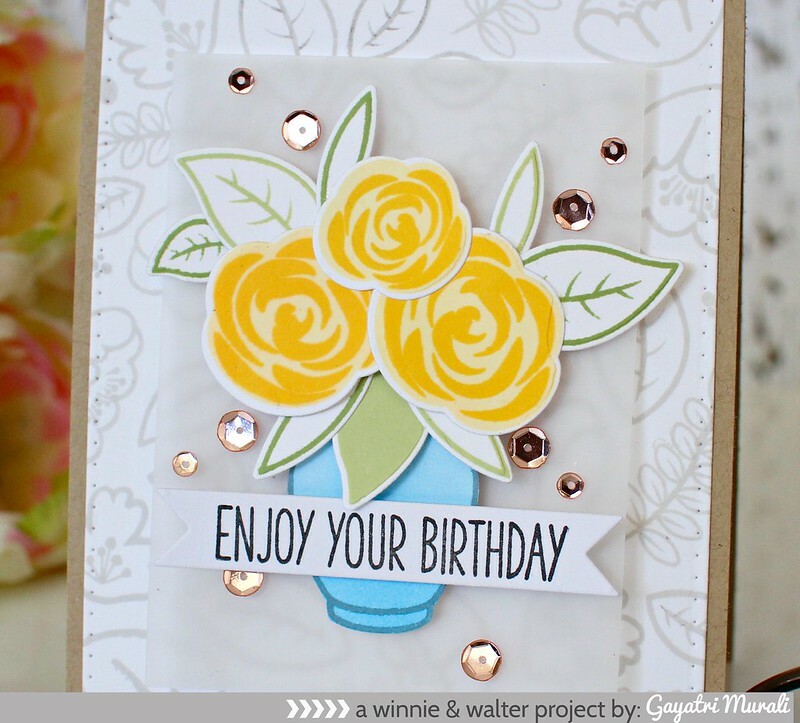 For the focal point, I stamped the layered flowers in two shades of yellow, the outline leaves and solid leaves in two shades of green and die cut them out. The vase, I sponged Salty Ocean distress ink, then stamped the vase image and hand cut it out because I did not want the white outline around the image. I clustered the flowers and leaves and adhered the cluster on the vase. Adhered the entire arrangement on a vellum panel using foam adhesives and the entire vellum panel on top of the stamped card front. I stamped the sentiment from Sugar Rush stamp set from W&W on the banner die cut from Essentials: Katharine Cutaway and adhered as shown. Finally added some rose gold sequins from Pretty Pink Posh. 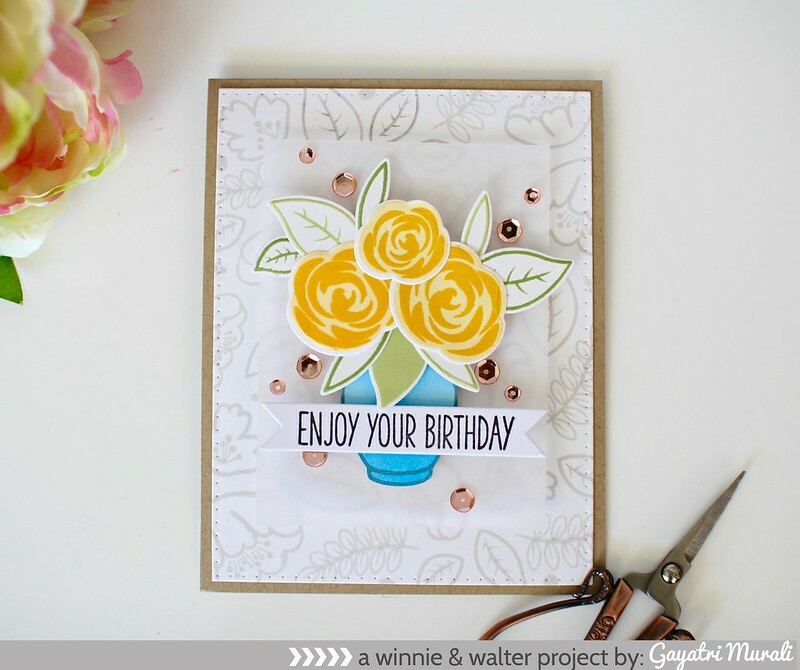 Create a new project using In Bloom: Lola’s Bouquet with Joni Andaya (and/or coordinating cutaways and/or the coordinating cut files). An alternative to using In Bloom: Lola’s Bouquet with Joni Andaya (and/or coordinating cutaways and/or the coordinating cut files) is to create a new project using one of the projects featured in this post (or any Rerun post throughout August) as your inspiration. Make sure you use at least one (1) w&w product (this can include a freebie) in your project. If you choose the alternative to using In Bloom: Lola’s Bouquet with Joni Andaya (and/or coordinating cutaways and/or the coordinating cut files), please include in your post or project description which project inspired you and how. Oh, Gayatri, this is beautiful! I love the sweet bouquet you've made with this set and the lovely vase! And I always love making DP from stamp sets. Beautifully done, sweet friend! Love all the sequins too! Hugs! So beautifully designed! I've been trying to decide how to use my W&W gc–maybe I'll get this set! Thanks for the inspiration, Gayatri!